Battery weed eaters have gained more popularity owing to their zero emission level and unrestricted mobility. The search for the best battery weed eater might be quite time-consuming. Sometimes, you’ll need to spend hours of research in front of your computer screen, something that most of us find to be quite uncomfortable. To ease it up for you, we’ve prepared a review of the best cordless weed eaters to help you make an informed purchase decision. You can also read other product reviews such as 4-cycle gas weed eater, gas weed eater, weed eater, pole hedge trimmer, string trimmer head, trimmer line. Black & Decker LST300 is a 2-in-1 battery weed eater. Apart from the trimming function, this weed eater is designed to also double as an edger. This makes it a versatile weed eater that provides two landscaping functions in just one tool. The battery that powers this weed eater is a 20-Volt maximum lithium ion rated at 2 Ah. This is a battery that’s designed to fit other tools besides your weed eater. It delivers 33% more run time, a feature that lets it power you for up to 30 minutes. A powerdrive transmission system ensures that more power is delivered from the motor to the cutting string. That means that the job is done faster and more efficiently. Black & Decker LST300 has an automatic feed spool that lets you continue working without the need to stop and feed the line. That results to more productivity since downtime is reduced to a great deal. The cutting string has a diameter of 0.065 inch, a feature that makes it ideal for light to medium work. It delivers a cutting path of 12 inches ideal for small to light use. The shaft comes straight to provide easy access under shrubs and bushes. It can be adjusted to match the height of the operator. This gives you maximum comfort and control over the machine. Black & Decker LST300 starts easy and runs quiet. It comes light at 5.7 pounds, a feature that comes in handy to minimize user fatigue and allow for easy maneuvers. Upon purchase, you get a 2-year limited warranty. Black &amp;amp;amp;amp;amp;amp;amp;amp;amp; Decker LST300 provides extended run time from its 20 Volts lithium ion battery. It has a 0.065 inch line diameter delivering a cutting width of 12 inches. Going by these specs, it is a good choice for light trimming of grass and some weeds in lawns measuring up to 1/3 acre. In this kit, Black & Decker LCC140 gives you two separate tools: Black & Decker LCC140 weed eater and sweeper that cleans after the trimmed weeds. Well, down to the weed eater, Black & Decker LCC140 comes in a 2-in-1 design. It easily converts to an edger in seconds to provide a multi-functional yard tool. Power is derived from a 40-Volt maximum lithium ion battery. This 2 Ah battery comes quite light and provides extended run time that lasts longer in your job. It comes with a fast charge that gives you full charge in about 1 hour. The motor is connected to a gear drive system that ensures more power is delivered to the cutting string. A command dial lets you regulate the power to match the job condition. It lets you set the motor to a speed of 0 - 6,500 RPM or 0 - 8,500 RPM. The feed spool system is automatic to eliminate the need to stop in the middle of your work. With a 13-inch cutting swath and 0.065 inch line diameter, this weed eater makes a handy choice for light to moderate trimming jobs. The shaft extends to match your height and comes straight to reach under bushes and shrubs. Both the weed eater and sweeper come lightweight to minimize user strain while handling. The sweeper weighs at 4.7 pounds while the weed eater weighs at 8 pounds. At a blow speed of 120 MPH, the sweeper is powerful enough to clear debris off your patio, lawn and pavements. Black & Decker LCC140 combo kit is backed by a 3-year limited warranty. Black &amp;amp;amp;amp;amp;amp;amp;amp;amp; Decker LCC140 combo kit is good for those that want to clean after trimmed grass and weeds. The 40V battery size, 0.065-inch line and 13-inch cutting diameter make it ideal for light to moderate trimming jobs in lawns and yards measuring up to 1 acre. GreenWorks STBA40B210 is yet another combo kit that includes a weed eater and blower. Both tools are powered by a 40-Volt lithium ion battery. The 2 Ah batteries provide a run time of up to 45 minutes for extended use. Starting with the weed eater, it comes lightweight at 7.8 pounds. Combined with the comfortable ergonomic grip, you get a tool that reduces user fatigue and lets you operate it for longer. In short, it comes 32% lighter compared to its gas-powered counterparts. Unlike the gas models, you get a quiet operation that is 50% less noisier. There’s a variable trigger that lets you adjust the motor speed for maximized power or run time. The front-mounted motor gives the weed eater a better balance for maximized handling comfort. This weed eater has a line diameter of 0.065 inch and a cutting diameter of 12 inches, which makes it ideal for light to moderate use. The axial blower also makes use of a 40-Volt lithium ion battery for extended run time. Its speed is adjustable to a maximum of 110 MPH, which translates to about 390 CFM. This gives better control and makes clearing of leaves and debris much easier. GreenWorks STBA40B210 combo kit comes with a 3-year limited warranty. GreenWorks STBA40B210 is a great combo kit for those that want to clean after the trimmed weed and grasses. The 40V battery, 12-inch cutting path and 0.065-inch line diameter sported by the weed eater makes it ideal for light to moderate trimming jobs in yards measuring up to 1 acre. Black & Decker LST136W enters the list to give a lightweight weed eater that’s got impressive power under its hood. Weighing at 7.8 pounds, this weed eater comes light enough to save you from getting tired to sooner. With it, you get hassle-free maneuvers and handling that let you work for longer. Black & Decker LST136W is a 2-in-1 tool that doubles as an edger in just a matter of seconds. This multi-functional yard weed eater comes equipped with a 40-Volt lithium ion battery specially designed for maximum run time and power. A command dial lets you set the motor to two different speeds: 6,500 RPM or 8,500 RPM. At the lower speed of 6,500 RPM, you get a maximized run time of up to 50 minutes. On the other hand, the top speed of 8,500 RPM gives you maximum torque and a run time of up to 30 minutes. The powerdrive transmission mechanism means more cutting power and faster jobs. This weed eater has an automatic feed spool system for continuous working that’s bump-free. Black & Decker LST136W has 0.065-inch diameter and delivers a cutting diameter of 13 inches, a feature that’s ideal for light to moderate trimming jobs. The auxiliary handle gives you ergonomic multi-position grip for better control and maximized comfort. Black & Decker LST136W comes with a 3-year limited warranty that caters for defects in material or workmanship. Black &amp;amp;amp;amp;amp;amp;amp;amp;amp; Decker LST136W has good specs that include a 40V battery designed for maximized power and run time. It sports a 0.065-inch line and a cutting diameter of 13 inches. This makes it ideal for light duty to medium trimming jobs in areas measuring up to 1 acre. Worx WG175 takes the multi-functional design of a landscaping tool to a whole new level. It gives you 3 different tools in one machine. These include a trimmer, edger and a mini-mower. You get all the functions in one economical tool. Worx WG175 is equipped with a motor powered by a 32-Volt maximum lithium battery. The battery comes in a pack of two to give you twice the run time. Combined with the included charger, you get minimum downtime and improved productivity. Equipped with a telescopic shaft, this weed eater lets you adjust the height to match your size. The trimmer head can be tilted to 90 degrees for edging tasks. The feed spool is automatic for bump-free continuous working. This weed eater has a cutting path of 12 inches and a line diameter of 0.065 inch, which comes in handy to tackle light to moderate trimming tasks. There are dual-position in-line wheels for hassle-free edging and mowing tasks. Worx WG175 comes in a lightweight construction of 6.2 pounds for reduced user fatigue. It is backed by a 3-year limited warranty. Worx WG175 packs an impressive power in its 32-volt battery pack. It provides a 12-inch cutting swath and a line diameter of 0.065 inch. These specs make it an ideal multi-functional yard tool for light to medium-duty tasks in areas up to 2/3 acres. Black & Decker LSTE525 comes in as the most lightweight in our list. This weed eater weighs a mere 5.3 pounds, a feature that reduces user strain and allows for easy maneuvering. The 2-in-1 design lets it convert to an edger in seconds creating a versatile tool for yard work. Powering this weed eater is a 20-Volt lithium ion battery rated at 1.5 Ah. It provides extended run time for improved efficiency. There are two batteries included to provide you with a double run time. That translates to less downtime and improved productivity. A powerdrive transmission delivers more power to the cutting string for maximized torque. The motor can be set to two different speeds via a power command dial. The low speed of 5,500 RPM gives you maximum run time while the top speed of 7,200 RPM provides maximum power. Easy bump-free feed is achieved via an automatic feed spool system. Black & Decker LSTE525 has a line diameter of 0.065 inch and a cutting path of 12 inches. These make it ideal for light to moderate jobs. The handle and height are adjustable for enhanced user comfort. The grips are soft and non-slip to provide better control and comfort. Black & Decker LSTE525 weed eater comes with a 2-year limited warranty. Black &amp;amp;amp;amp;amp;amp;amp;amp;amp; Decker LSTE525 provide the convenience of two 20 Volts batteries that give more run time. It has a line diameter of 0.065 inch and a generous cutting path of 12 inches. This makes it perfect light to moderate trimming in areas measuring up to 1/3 acre. DeWalt DCST920P1 closes our list in style with its well-balanced construction that packs a punch. This weed eater has a weight of 8.5 pounds, a feature that gives it a spot in the lightweight category. With it, the operator gets less fatigue and handling becomes much easier. DeWalt DCST920P1 is equipped with a 20-Volt lithium ion battery. This 5 Ah battery powers a high-efficiency brushless motor designed to provide maximized run time and extended life. The speed of the motor is variable and can be set to two different levels: 0 - 4,600 RPM and 0 - 6,000 RPM. At 0 - 4,600 RPM, you get a run time of up to 50 minutes while 0 - 6,000 RPM gives you maximum power. A patented gear drive system delivers more cutting power that makes easy work of tough overgrowth. DeWalt DCST920P1 has a line diameter of 0.08 inch and a cutting swath of 13 inches. Such a combination gives it the ability to tackle light to medium trimming jobs. The dual-line head provides double cutting and trimming capacity. It requires bumping against the ground to feed the trimming line from the spool. This weed eater comes with a 3-year limited warranty, 1-year free service and 90-day money back guarantee. The 20V lithium battery combined with the brushless motor provide maximum run time and extreme durability. The 13-inch cutting path and 0.080-inch line diameter are quite impressive. These specs make DeWalt DCST920P1 a great choice for those in search of a high-efficiency weed eater for light-duty to medium-duty trimming tasks in yards measuring up to 1/3 acre. Electric weed eaters come in two main categories: corded electric weed eaters and cordless electric weed eaters. 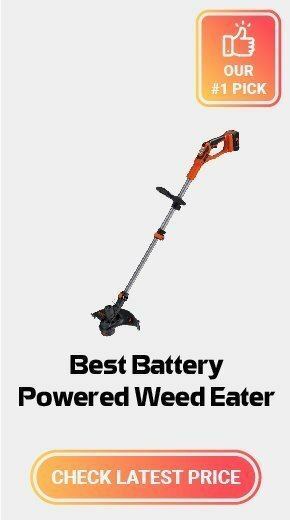 Also known as battery weed eaters, this type of weed eaters run on battery power. The size of the battery varies from one model to another. 18 Volts cordless weed eaters are ideal for lawns measuring up to 1/3 acre while 24 Volts cordless weed eaters are perfect for lawns up to 2/3 acre. Those above 36 Volts come in handy for lawns measuring up to 2/3 acre. Cordless weed eaters have one main advantage over the corded electric weed eaters. They give you complete freedom from cords, a feature that makes them extremely portable. That said, they can be used just about anywhere. Corded weed eaters come with a power cord that needs plugging into the main. That means that usage is limited by the length of the cord. These weed eaters come with different motor sizes rated in amps. Generally, the higher the amp, the more powerful the motor. Corded electric weed eaters are specially designed for small lawns measuring up to 1/3 acre. This type of weed eater generally comes lighter compared to cordless weed eaters since there is no additional weight of batteries. Battery powered weed eaters or cordless weed eaters have many advantages that give them an upper hand over most gas-powered and corded weed eaters. Let’s look into detail at the advantages that make a battery powered weed eater a more convenient choice. Lighter: Though every models comes quite different, battery powered weed eaters are generally more lighter compared to gas-powered weed eaters. It’s not uncommon to find battery weed eaters that come at half the weight of the gas models. The reason for their lightweight construction comes from the fact that they sport lightweight aluminum shafts and smaller heads. They also lack an internal combustion engine that contributes more to its handy lightweight construction. Generally, battery weed eaters weigh less than 13 pounds. Quieter: Weed eaters can be quite noisy, especially the gas powered models. Some may require protective hearing aid in order to operate comfortably. Battery weed eaters come quieter to the extent that you may not need hearing aid to operate. You can get some models that are as quiet as 85 dB. No emission: With battery powered weed eaters, you get the convenience of zero emission, a feature that makes them more eco-friendly. In short, they have a very limited carbon foot print compared to gas units, especially those with 2-cycle engines. Unlimited mobility: Battery units can be used just about anywhere. Unlike corded electric units, there’s no limitation to the range of usage.